- For guidelines and policies click here and search Wheatland County's website for "fire permits". "The Rosebud Rural Fire Association was formed in the fall of 1976 prompted by a couple of fires that occured in the district at that time. The first fire was in a feed stack at Jim Clark's place on a Saturday afternoon and the second was the next Sunday afternoon at the nuisance grounds (directly north and east of the Rosebud church manse facing the golf course). There was quite a strong wind that day, and the fire got away and started across country and along the railway tracks. At that time Rosebud had no fire fighting equipment, so a group got together and it was decided to form a Fire Association. In 1983 they had a fire hall, a fire truck with a water tank and a pump which works quite well, giving the community some security. "It sure beat a gunny sack and a five gallon pail." " Very important to Rick was his dedication to the volunteer fire departments in both Rockyford and Rosebud. Rick trained hard and worked hard. 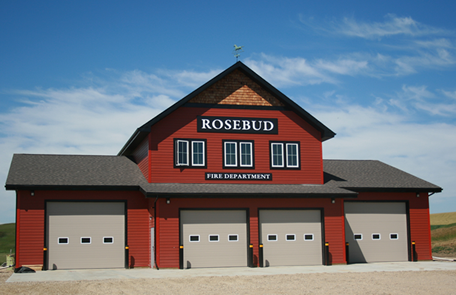 Everyone will agree that his commitment was an integral part of the new fire hall in Rosebud." The Rosebud Lions Association held its Ray Zachariassen Memorial Golf Tournament and supper in conjunction with the Grand Opening of the Rosebud Fire Hall, which made for fun-filled day - despite the late afternoon rainstorm on Aug. 15. Chairman of the Board (of the Fire Department) Deputy Chief Rick Zachariassen, gathered the department´s volunteer firefighters for the official ribbon cutting ceremony. He said that (their) "ground-breaking happened in July of 2009 when we dug the footings for the building, but we did start working on the project the year before with preparations on the site." Zachariassen stood tall as he proudly pointed out the fact that "90 per cent of the project was volunteer hours and hard work from the members of the department and local men and women who devoted time and talents to the facility."